Hey there. 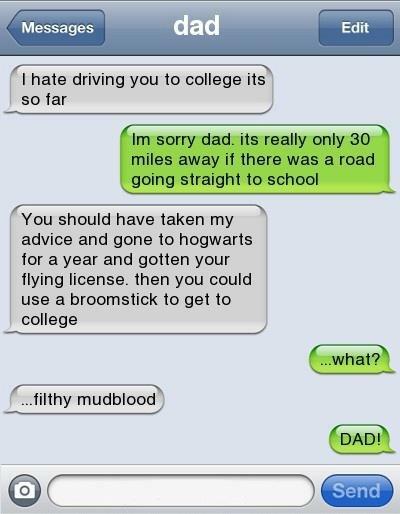 I love this and the reason I believe that I love this so much is because a conversation like this would SO HAPPEN between my daughter and I. lol Yeah... I'm that kind of parent. Once, while walking my daughters to school, I said, "Let's robot across the street!" LMAO! The younger and I start doing it and my older daughter goes, "DAD! ", and walks faster. Ah... the joys of being a parent! =oD Later! Haha! LOL! :D This is a very funny conversation. I would like to get involve in this kind of conversation. ;) Good Times! i saw another one of these recently, they're funny!